for Civil and family courts in England & Wales. From 26th of June 2017, Ubiqus was appointed by the Ministry of Justice to transcribe High Court and County Court hearings in England and Wales. for our standard 12 working day or 48 hour turnaround. 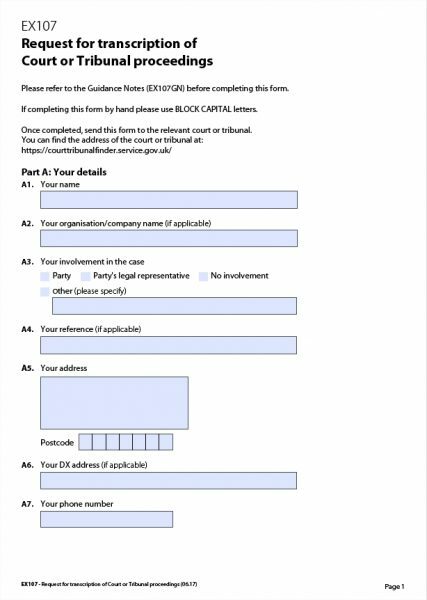 Once filled out, attach your EX107 form to the below on-line form. AND send a copy to the relevant court. We will request the audio file of your hearing to the relevant court. Once the audio is received, we will provide you with a quotation based on the information provided and request prepayment. All costs are estimated. We will only be able to confirm the final amount once the transcript is done. Do not forget to send two copies of your EX107 form: one to Ubiqus and one to the court. Ubiqus does not have immediate access to the audio files of your hearing. We will have to request them to the court. In our experience, some courts are efficient in sending the audio back, some others aren’t. As part of our service, we will gladly chase the court for the audio if it is not provided within a reasonable time frame. Ubiqus cannot be held responsible for a slow response from the court. It often helps to have the client chasing the audio as well. Once we have received the audio, we will be able to prepare an estimate for providing the transcript request. Upon written approval of our estimate and prepayment in full (including VAT), we will start work on transcribing the hearing. All civil judgments need to be approved by the judge. We won’t be able to send you the judgment before the judge sends it back to us. The time taken by the judge to review the document is excluded from the agreed delivery time frame. The turnaround time starts from when we receive the audio from the court and payment is carried out in full (including VAT). *This does not include Weekends or Bank Holidays. Read our Terms & Conditions here. You send your EX107 in full to us AND the court. Your request is processed. We request the audio of the hearing. We make sure we get the right audio file from the court. With the right audio, we prepare the quote & request prepayment from you. You carry out the prepayment. We start the transcription process. Your agreed turnaround time starts now. The transcript of your judgement is sent to the judge for approval within the agreed time frame. The judge sends us their amendments. We amend the document and send it to you via email. A final invoice is sent to you. Please submit this information to our legal team preferably by email (enquiries are dealt with Monday to Friday, 9am to 6pm): We aim to respond to all emails within 10 working days. or call us between, Monday to Friday: 0207 759 2695 and select 1.